This is my go-to recipe when I want to make something quick that's a little fancier than plain ole spaghetti. The twisted corkscrew shape of the rotini holds in more of the spaghetti sauce keeping the dish moist and yummy. Enjoy! Preheat oven to 375 degrees. Cook pasta according to package directions. Set aside. Brown ground beef in a large skillet; drain. In a large bowl combine the cooked pasta, cooked ground beef, spaghetti sauce, sliced mushrooms, onion flakes, and 1/2 of the parmesan cheese (1/4 cup). Spoon into a 13x9 inch dish; top with the remaining 1/4 of parmesan and the mozzarella cheese. Bake 20 minutes. Makes 6 servings. 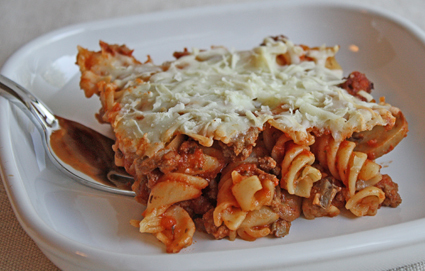 Variation: Substitute italian sausage for 1/2 of the ground beef. I love rotini for that same reason too... This looks really delicious :) Thanks for sharing!